I felt inspired by Crafts by Amanda – Cardboard Tube Bunny Rabit on Pinterest yesterday, so with an eager 3 year old helper, we made our own version yesterday. Instead of paint we used colored construction paper and double sided tape and glue. After cutting the cardboard rolls (and covering an old container in purple to make a big bunny), I adhered the paper, glued on the pom pom noses and tails, and used some marker for the eyes, whiskers, mouth and ears. I had some scraps of felt and fabric that I cut into shapes for the cute bow and clothes. Pretty cute, huh?! I’m all about quick and easy crafts – especially with little kiddos with short attention spans! I also like using whatever we have around the house to create little projects. As we wait for more spring-like weather, crafting has been a good boredom buster in our home. For more craft ideas, check out my craft and kiddos boards on Pinterest, or see these related articles below. Happy Crafting! 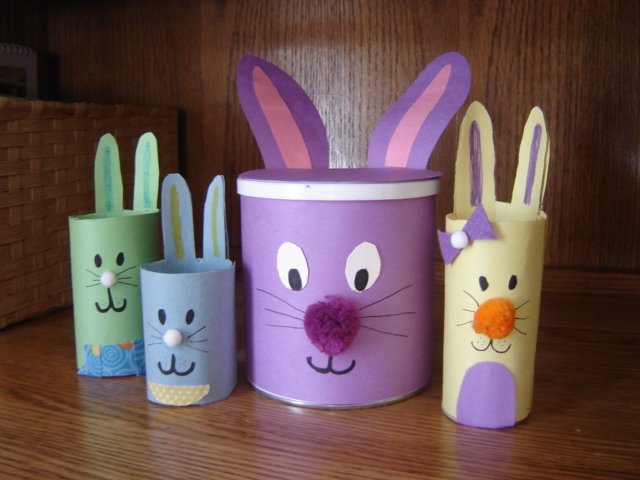 This entry was posted in DIY Crafts, Kids and tagged Adhesive, bunny rabit, cardboard rolls, colored construction paper, Construction paper, Craft, diy, Easter, Easter Bunny, Home, Paper, Pinterest, pom pom by Cathy O. Bookmark the permalink. Thanks! Hope you have fun with it! Of course moms have to really see the project through to the end! I got these bunnies out to decorate for Easter and wanted to share this easy and fun craft! Happy Easter!